"The New Cup" doesn't erase the concerns I have about the Conchords' musical numbers from last week's episode or next week's. Taken on its own, though, this was perfection, as both comedy and as musical. "Sugar Lumps" was one of the catchiest, funniest music videos they've done to date (and not not just because it appropriately worked Dave into the fun). Bret's reggae-inflected plea for Jemaine to give up a life of prostitution was almost as entertaining. But at this point, I'm watching "Conchords" for the deadpan farce more than the tunes, and this one was magnificently constructed. They really put in the time to explain all the ways that Bret's purchase of a $2.79 cup would destroy the guys' lives, which led to three beautiful pay-offs at the end: Bret getting arrested by making an untimely reference to his day job, Jemaine's line in the jail cell that I quoted above, and then the Rube Goldberg-ian path of destruction for the new cup the moment the power company turned the lights back on. Weaving hilariously in and out of the money problems, Bret's counter-productive super-straw business, and Bret and Jemaine's attempt to entice prostitution clients by offering them a piece of nut loaf, we got Murray being one of the last men in the country naive enough to believe in the Nigerian internet scam, and the only one lucky enough for this to turn out to involve an actual Nigerian with an actual business proposition. Maybe the internet really is, as Murray puts it, "one of the trusted things of today's society," and I should stop giving Murray such a hard time. Really, every corner of this episode was filled with straight-faced gags that busted me up: Doug trying to be cool about Mel getting massaged by the Conchords (and Mel's orgasmic reaction to barely being touched by Jemaine), or the awkward and lengthy conversation between Jemaine and Eugene the landlord about how Eugene knows so much about prostitution, or Murray's digression on the bass as "the daddy guitar." I'm not sure I can think of a first season episode that made me laugh as consistently as "The New Cup" did. 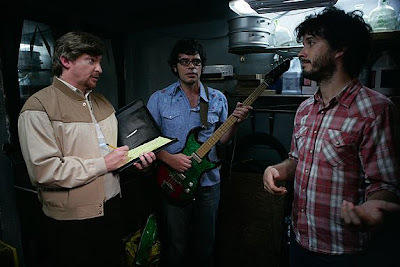 Finally, I'm doing an interview with Bret, Jemaine and "Conchords" producer James Bobin tomorrow morning, and I'm open to suggestions for things to ask about. No promises, depending on how the conversation goes, but fire away. 2 episodes and one funny song. Things are not lookin good and can we give up the poor schtick. The song tonight was funny at least. Oh my god, I laughed more at "sugar lumps" than I have at any song since the Rhymenocerous vs. the Hiphopopotamus. Sorry to hear that next week is a slow one, because this week's episode was one of the best in my opinion. This question might be an obvious one (or perhaps even already answered elsewhere), but I'm curious if they felt more of a need to write songs that they could build episodes around this season, as opposed to the first season when most (if not all) of the songs were already written, with episodes constructed around them. Tonight's episode would be a good example. Did they write a song influenced by "Roxanne," and then work on an episode with Jermaine being a prostitute, or did they come up with the idea for a show about prostitution and then write the song around that? I'm just curious which way they worked this season: from songs to episode ideas, or episode ideas to songs. I LMAO at this ep, from everything Murray did to how Bret seemed to know what to say when soliciting Johnettes for Jemaine to "Sugar Lumps" to the "man-ho" song. And then the poor cup winds up shattered at the end. Excellent all around. I'm wondering what the likelihood of a third season is. Could you ask them whether the difficulty in writing songs for Season 2 has put them off doing more seasons in the future? And would they ever consider having "outsiders" help them write songs? Presumably Bret and Jemaine write all the songs for the show. Would they ever throw the process open to others? I don't know if Bobin contributes to the songs, actually. But having someone like Paul Simms contribute seems like it might be an interesting idea. I wonder if shooting on the streets of NY was any different during the second season. The first season Bret and Jemaine were relatively unknown, but that can't be the case any longer. Oh, and was I the only one waiting/fearing a "two dudes, one cup" joke? Or did they sneak one past me? "I have a few rules, 1. no laughing, especially during, okay ... it puts me off"
I'd love it if you could ask them whether it was easier to write the second season, since they've been through it once before, and have more experience in writing the various characters, or it is harder, because they have to write the songs as well? Was the writing process any different? Also, could you ask them about possible other acting projects they'll have after the season/series ends, and/or if they'd be looking more for music related projects? Thanks, Alan. I hope you have a blast interviewing them. Can I be a total girl and say, SQUEE! I've lived downtown my entire adult life. This show better than any other I've ever seen - including the much hyped Rent - captures what it's like to live here and and make music or art. Stuff like that cup thing happened to me and people I know tons of times. It becomes a rolling horror show. Just like the show, it is weird and hilarious trying to make a go of it in NYC without cash, particularly in your 20s before you become connected. This was probably more relevant to season one, but: I wondered if they do a coin toss on whether "Bret" or "Jemaine" gets the A-story in a given episode. In this episode, for example, was it just coincidence that "Bret" was the one to foolishly buy the cup, or is it something they thought "Bret" was more likely to do? Did "Bret" just get lucky in being tagged the (slightly more) accomplished ladies man in season one? Also, who on the show has a love of underappreciated NYC landmarks (the bandshell tour, the visit to the Queens Museum of Art)? Can we expect more of that this season? I thought the funniest stuff was when they were sitting with the lights out. "What's the expression on your face?" And then when Bret tried to figure out the math behind his straw scheme and thought he could make it up in volume for a split second before stopping himself. I love that style of dead pan delivery. See, "Sugar Lumps" did nothing for me: yes, I'm more a fan of their melodic stuff than I am of their rap stuff, but while I understand the inherent humour even then this one didn't do anything for me. And while I liked the ripoff of Roxanne, it never went anywhere musically or video-wise: it just took writhing and dancing Jermaine from the first video and put him in short shorts. I found the songs put me off of the whole prostitution storyline, nut bread and all: the songs felt forced into that particular mode, and thus the storyline felt kind of forced as well. By comparison, the stuff with the cup, the straws, everything with Murray: all comic gold. It felt like the show didn't need the broadness of the prostitution to get its point across, and simple works better for the show in my eyes. I still like the show, but my reviews are just becoming more and more negative. Here's hoping there's a song or an episode that really turns it around so my hyper-critical alarm doesn't keep going off involuntarily. This episode was really one of the best ever. Usually I fast forward through the songs or go do something else when they start singing. But the songs were actually good in this one! This episode really came together perfectly! Thanks for the suggestions, guys. I used a bunch of them (James Bobbin took credit for the show's architectural fascination), and it was very lively. I'm not sure how easy it'll be to transcribe, or if I'll just give up after a while, though. The accents are even thicker in real life than on the show. Feel free to mock me if this is wrong, but wasn't the Nigerian businessman played by Brother Mouzone? Best crossover ever. If you could ask them if they are coming to Europe on tour, that would be awesome! "Feel free to mock me if this is wrong, but wasn't the Nigerian businessman played by Brother Mouzone? Best crossover ever." Consider yourself mocked. No way that was Michael Potts. I hope David Mills doesn't read this - could be the misidentified black person for the day. Nope, it's right, Michael Potts' name is in the credits. So, I take back my invitation to be mocked. OK. I'm a bit thick. I just realized that Doug was also in The Wire. Wow. :D Anyway, that scene with Doug watching Mel enjoying her 'massage' gave me a fit of giggles. 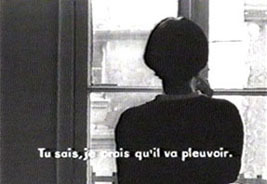 I sure hope you won't give up on transcribing that interview you did - it's always fun to read those. Kinda wished they showed a little arm and shoulder when they were workin it. Wow. I didn't notice that Mr. Mel is also Managing Editor Thomas Klebanow. Burn Notice, "Hot Spot": Where's Wallace? 24: See you in the next life, Jack! HIMYM, "Benefits": Steinfeld did it again! NPH + SNL = LOL? His viral video is his viral video! "My, my, my. What. A. Mess." And the new Doctor Who is... this guy?